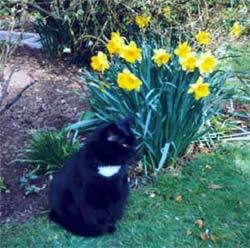 Tim believes in saying it with flowers, especially when the yellow daffodils complement his black coat so beautifully. Gyp's keeping a low profile, with just the occasional check to see if the food bowl's been replenished. Winter has descended on the small Southern English Village that is the home of Gypsy and Tim. 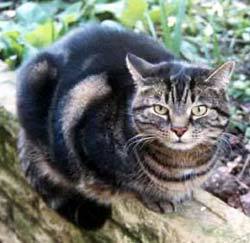 Cats in other parts of the world may consider the climate in this area to be mild. The boys disagree, they dont do cold, they dont do wet, and they especially DO NOT do COLD AND WET, not since the time in the cage. (See episode 2). Winter 2002 in southern England so far has not been too cold, but very wet. By 9 oclock in the morning, the boys are snuggled down on, rather than under, the duvet. They tried under once, but were sat on, so on is safer. by the Royal Navy as a punishment on sailors. Gypsy Details, its a great title. We can do episode 8, the missing chapter, later. treats out. So what are we going to tell the people about whats been going on? Tim We must talk about your diet. Tim What do you mean mine? Im not on a diet! Tim We are English cats; we should talk about the weather. Gypsy Now, whos changing the subject? The weather has been good this winter. backdoor. Sometimes I get quite soaked going over there. bedroom. They are just cat-sized, and very comfortable. move quite quickly when I flick a lump of frozen mud carefully onto her. letting it dry, then grooming it out, and thats what he did. cats fundamental feline right to have a full stomach at all times. Staff Notice. I wondered when I was going to get a word in; these cats will talk the hind leg off a donkey if they get the chance. Tim Ill talk to you later. How will the donkey be served? Staff Notice. 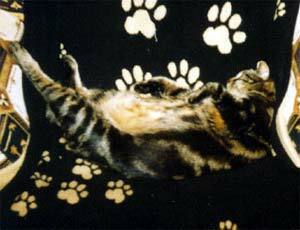 The boys are big cats, Gyps weighed in at 7.2 Kilos. The Vet only has metric scales, so for those lucky people using imperial units of measure, I will translate. That is about 16 pounds. 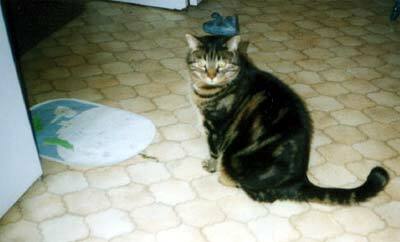 Gypsy was allowed an allowance of 75 units of food per day. Timmy could have as much of his food as he wanted. Trouble was Gyps liked Timmys, and Timmy liked Gypsys. then weighed the cage, and after that trip Ive always been weighed in the cage. After a few months they started feeding me upstairs, and Timmy down-stairs. Tim That was fun; we had them running around the house at breakfast time. Tim They soon caught on to that one and John fed us both. Staff Notice. After the second month Gypsy had lost about 5 pounds. Tim I managed to lose about 5 pounds, as you scoffed most of my food. Staff Notice. While the staff had a well deserved holiday in the land of the swinging kilts, the boys decided to stay home, and guard their property. A neighbour came in twice a day, to feed and entertain them. Timmy being a nervous cat often hid when she came in, so Gyps got extras. the VET yet again. It had been a good few weeks; I was up to 7.9 Kilos. Trouble was, there was a new VET. Staff Notice. We went through exactly what and when, the boys had to eat. and only put down again if we asked. weighed out my food each night and morning. Staff Notice. He has been cut down by ¼ oz per day, not much, but he now gets 1¼ ounces each morning and one ounce each evening. Timmy is being cut back as well, as he is becoming plump. Tim In two weeks you hear the results. Gypsy But this is the end of the episode; the fans will have to wait to see what happens. Tim Always leave em wanting more. Tim Goodnight Timmy. Anyone want a bet on how much Slim has gained? Staff Notice. Dont tell Timmy, but he is going to see the vet too, it is time for the boys annual vaccination. Ok, the joke's over, put the food back! Me, plump! How dare he! Episode 10 - Striped Cats Cant Count. 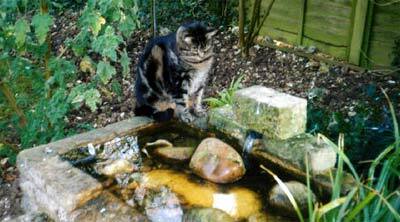 The long hot summer of 2003 is drawing to an end in Southern England, where Gypsy and Timmy have spent the season relaxing. 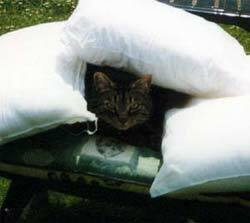 Gypsy prefers a comfortable bed in a south facing room, with windows open and curtains closed. 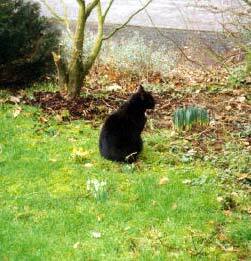 Timmy, on the other hand, favours a nice bed of dry grass under a shrub in the garden. Once the unfortunate incident involving a hose-pipe and the staff watering the strawberry plants was sorted out, his life was as tranquil as Gypsys. At night they still like their individual armchairs in the lounge. Gypsy has been known to insist that the staff move out of his chair so he can settle down for the night as early as 7 oclock in the evening. whats the idea of this title? chapter 9, so we are now doing chapter 9, which is called Chapter 10. Gypsy That’s what I get for letting you go first in the discussion. Tim I didn’t notice that comment at the end of Chapter 9, about time for the jabs. 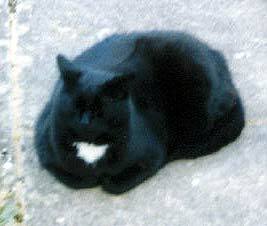 Vet said I was over-weight (complete lie naturally), and I was put on a diet. Tim This time I was grabbed as well, put in a travelling basket, and loaded into the car. We both sang all the way to the V-E-T-S.
Staff Notice: The trip to the vets is along country lanes for most of the journey, and takes about 25-30 minutes. However with both boys in fine voice, we got it down to about 20. Timmy had not been in the car since his last injection trip, about one year earlier. Gypsy is, by now, an old hand at travelling in cars. Gypsy Not so much of the old, experienced car passenger, I prefer. cats only waiting room, (good VET this) until the nurse arrives. Tim “Cats Only” is good, pity they can’t keep the humans out. back to the car, we go home. I sleep all the way. food was changed to a new type. A couple of weeks later the food changed again. yet another different food in the bowl. I rebelled, and refused to eat it. Staff Notice: When Gypsy refuses to eat, the world holds its breath. Tim Even I was worried. Gyps started taking my food. Staff Notice. 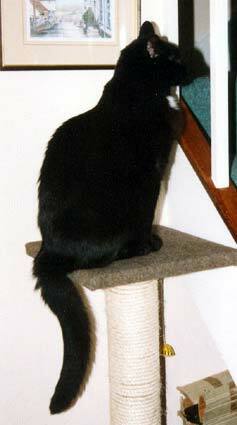 While Gyps was on his diet (15 months), he was fed in one room, Timmy in another. Timmy was not too fond of Gyps’ diet rations, and as Gyps was, it was reasonably easy to keep them apart. Gypsy I quite like the dry (kibble) food, although I will eat the wet, canned stuff. Tim You will eat anything. caught I home to show to Thelma & John. They were pleased. Tim So the vet changed the food? suddenly they changed it again. Staff Notice. Gyps was getting low on second type of food, but when I went back to get some more, the vet had run out, so they switched him to a third type of diet food. He had lost quite a bit of weight (20-30 grams) while he was on the second type in only 2 weeks. He did have a few days to change from one type to another, But I could see he was getting fed up (ho, ho) with the frequent changes. Tim Variety is the spice of life. the VET, I’d put on all the weight I’d lost. Staff Notice. Worse, the vet had discovered that the manufacturer of the second type, the one that really worked, was not going to make any more of it, so a fourth diet food was prescribed. That’s when Gyps revolted. I’m losing a little. Cats 1 Vets 0. I do miss the car trips though. Staff Notice. In about two months since ending the diet, Gyps has lost about 2 pounds in weight. Timmy is now a lap cat when I’m working on the PC, and he is assisting with this. and breakfast was very late this morning. Gypsy That is no excuse. I’ll let you know. I’m off to my radiator hammock now. Say goodnight Gypsy. Gypsy I’m off to my armchair. Goodbye for now. The perfect follow up to a good meal. If anyone comes down those stairs, I'll be onto them. The lengths to which a cat has to go to supplement his diet!